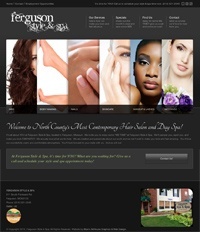 Ferguson Style & Spa is a contemporary hair salon and day spa in Ferguson, MO. For this website we selected a sleek, sophisticated template with dark greens and black color palette. The unique accordion slider on the front page beautifully showcases their services.